Nagarhole gains its name from the snake like river that winds its way through it. The park was once an exclusive hunting reserve of the former rulers of Mysore in Karnataka. It's a place of unspoiled wilderness, with serene forest, bubbling streams, and a tranquil lake. Nagarhole teems with over 250 types of birds, elephants, sloth bear, bison, tiger, leopards, deer, and wild boars. It’s also officially known as Rajiv Gandhi National Park. In Karnataka state, 95 kilometers (60 miles) southwest of Mysore and bordering the state of Kerala. The Kabini River, the largest of the park's waterways, lies to its south and separates it from Bandipur National Park. The closest railway station is in Mysore, around four hours away from Nagarhole by road. Alternatively, there is an airport in Bangalore, around six hours away. The park has three main entrance gates, where safaris start from -- Veeranahosahalli (near Hunsur) on the northern side and Nanachi (near Kutta) on the western side towards Coorg, and Antharasanthe (near Kabini) on the eastern side towards Mysore. It takes about an hour to drive between them. The best time to view the animals is during the heat of March and April, when the waterholes are dry and the animals come out and visit the lake. However, the temperature is more pleasant from November to February. The monsoon season, from July to October, brings a lot of rain. Hence, safaris may not operate then and wildlife sighting is challenging. The roads that run through the park are open from 6 a.m. until 6 p.m., all year round. It's possible to drive along them in your own vehicle for free. However, you're not supposed to get out of your vehicle, and you can only remain inside the park for a restricted amount of time -- no speeding or stopping. Fines apply. If you want to go deep inside the park, you'll need to go on a safari. Jeep safaris using private vehicles were banned in 2011. Now, the two options for safaris are as follows. (Do note that the Forest Department revised the rates in November 2017. And, unlike many other popular national parks in India, the safaris cannot be booked online). Noisy 26-seater minibus (canter) safaris, operated by the Forest Department. These run twice per day -- early in the morning from 6.30 a.m to 9 a.m., and again in the afternoon from 3 p.m. to 5.30 p.m. The cost is 250 rupees per person for adults and 125 rupees for children. Tickets must be purchased in person from the Forest Department booking counters at the gates, which open about 30 minutes before the start of the safaris. Jeep safaris, booked through hotels and operated by Jungle Lodges & Resorts (owned by the Karnataka government). Your hotel booking will get you a place on this safari. If you stay at the JLR Kabini River Lodge, the cost will be included in the hotel tariff. Otherwise, you can expect to pay 1,500 rupees per person for the safari. 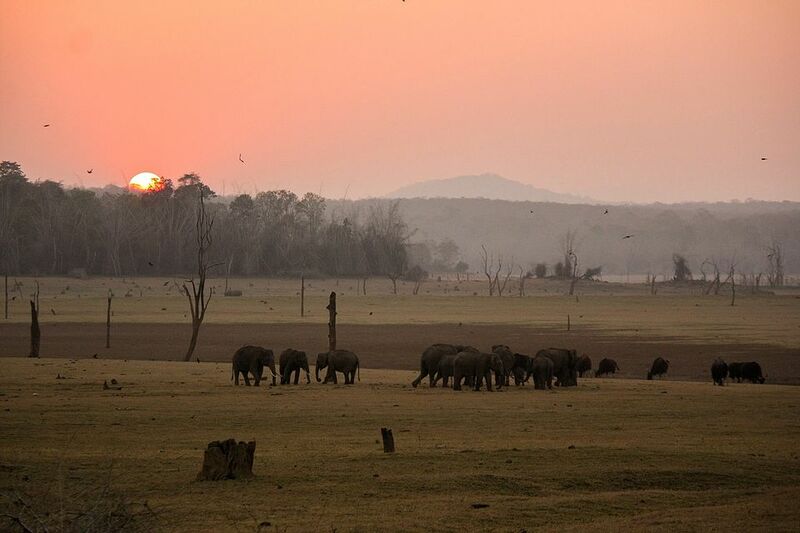 The jeep safaris depart from Kabini River Lodge in the morning at 6.30 a.m. and in the afternoon at 3.30 p.m. Depending on occupancy of the hotels in the area, there will usually be four to eight people in a jeep. Government-operated boat trips also depart Kabini River Lodge at the same time. A separate park entry fee of 250 rupees per person is also payable. A camera fee is also payable for DSLR cameras with lenses. This is 200 rupees for a lens up to 70 millimeters, 400 rupees for a lens between 70 and 200 millimeters, and 1,000 rupees for a lens above 200 millimeters. The park has two separate safari zones: Zone A is a wooded area and Zone B is close to the Kabini backwaters. The Jungle Lodges & Resorts jeep safaris can cover only one of the zones at a time, while the Forest Department canter safaris can enter both zones unrestricted. In early 2017, the safari starting point at Veeranahosahalli was relocated from the park's core to the periphery. This was necessary to reduce the movement of vehicles and human disturbance inside the park, due to noisy tourists stopping their vehicles and littering the area with trash. As a result, visitors coming from Hunsur will have to travel 35 kilometers (22 miles) less to reach the safari point. The Kabini side of the park is more tourist-friendly, with better (albeit expensive) accommodations and facilities for jeep safaris. Not all hotels provide safaris. If you're staying at a hotel that doesn't, you'll need to book your own canter safari through the Forest Department. Be sure to arrive an hour or two in advance in order to get tickets for the canter safaris because demand is high, especially on weekends. People start lining up really early and seats are limited. Ideally, if you can afford it, a jeep safari is a much better option. For canter safaris, Veeranahosahalli gate is less crowded than Nanachi gate. This is because most of the accommodations are situated in the vicinity of Kutta. The park offers the opportunity to see elephants close up in their natural habitat, and it’s not unusual to see herds of elephants on the river bank. The best option for seeing elephants is to take an afternoon boat ride (birds are mainly seen on the morning boat ride). However, the likelihood of seeing a tiger is rare compared to parks such as Bandhavgarh in north India. Jungle Lodges & Resorts Kabini River Lodge, located on the river at the Kabini side of the park, is a popular choice and they have packages including boating, jeep safaris, and elephant rides. Other top options in the area include Evolve Back Kabini, The Serai, Kaav Safari Lodge and Red Earth. At the northern edge of the park near Veeranahosahalli, Kings Sanctuary is set amid 34 acres of mango orchards and is a good luxury option. Less costly Jungle Inn is in the same area. Alternatively, Kutta has reasonably priced accommodations including homestays. Spice Garden is a recommended homestay in Kutta.